András Suki will guide the audience on the journey from the origins of Romani music to its present representations: from the musical life of Romani villages in Hungary, through the impact of Romani music on European classical music composers like Johannes Brahms, Franz Liszt, Béla Bartók and Igor Stravinsky, to the presence of Romani music in the everyday urban life of Hungary. All these stages will be illustrated with musical excerpts played by young musicians. The second part of the musical lecture will focus on the special musical teaching method which has been inscribed on the list of UNESCO Register of Best Safeguarding Practices in 2016. The method is founded on the knowledge preserved by Romani musician dynasties, and it is focusing on learning by ear and from the hands of teachers without the use of any score. András Suki comes from a musician Romani family. Following the family tradition, he became a classical pianist and piano teacher. At his solo and chamber music concerts, he plays a classical repertoire, and he has toured in Germany, France, Australia, Japan and India. Recently he has focused his activities to teach piano lessons, and to research Romani music and its teaching methodology. He teaches at primary music schools as well as in higher education institutions: the Egressy Béni Music School, the Vienna Konservatorium, Budapest and the Liszt Academy of Music. 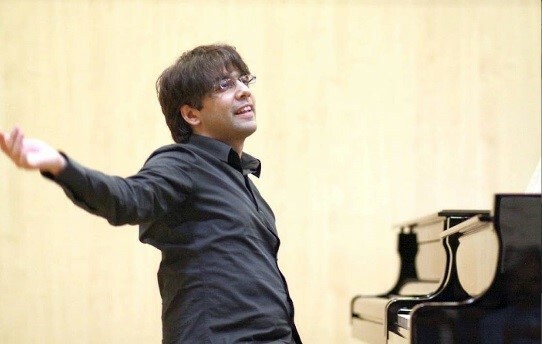 He has developed his own teaching methods by borrowing from the musical practices of classical music teaching and from Romani musical traditions. Hermes is the god of travelers, and a symbolic figure of transition in classical mythology. Accordingly, the main idea behind the HerMeS public lecture series, organized jointly by the Cultural Heritage Studies Program and the Center for Arts and Culture at CEU, is to nurture and renewal of cultural heritage. The series offers its audience a combination of talks and concerts, allowing them to travel along the borderlands of the performing arts and academic lectures.